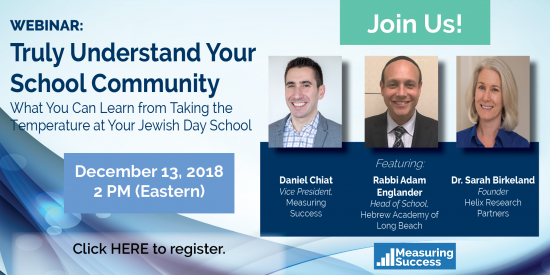 Hear from — and interact with — a prominent Head of School (Rabbi Adam Englander) and an esteemed education researcher (Dr. Sarah Birkeland) in a webinar facilitated by Measuring Success (Daniel Chiat) about the benefits of learning valuable feedback from your faculty, parents, and other key school constituent groups. The webinar will highlight the utility of a new Jewish Day School Faculty Survey. The survey, developed by Measuring Success, was supported by a foundation grant with the intention of creating a data-driven, peer-reviewed and modern faculty survey to strengthen faculty retention efforts at faith-based independent day schools. During the session, panelists will talk with Chiat about the benefits of comparing faculty satisfaction among the 10 schools currently participating in the survey cohort.